According to many UFOlogists and UFO hunters who,on a regular basis check NASA’s images from Mars, another artificial structure has been found on the surface of the red planet. Apparently this structure resembles statues that are found on Earth. 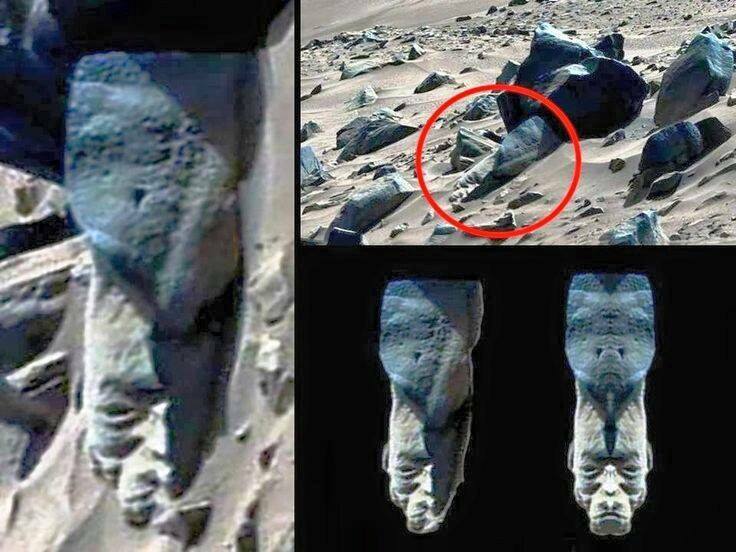 Ultimate evidence of ancient civilizations on Mars, or Pareidolia? While many people would disagree and say this is just another example of Pareidolia kicking in and making us see things that are not there, many others believe that Mars did in fact sustain life in the distant past and NASA’s rovers are finding evidence of that today. There are even scientists such as, Dr. Brandenburg who firmly believe that the red planet was inhabited in the distant past by two “Alien” civilizations which were wiped out by a third alien civilization with nuclear weapons. According to Dr Brandenburg, ancient Martians known as Cydonians and Utopians were massacred in the giant nuclear attack – and evidence of the genocide can still be seen today. The theory from Dr. Brandenburg suggests that Mars was very different in the distant past. If the Dr. Brandenburg’s theories are correct, it’s only logical finding statues, buildings, and other items on Mars. Here is the image, what do you think? Are we looking at a statue on the surface of Mars? Or is it just another rock and Pareidolia is kicking in? To check out the raw image provided by NASA, please follow this link and download the High resolution TIFF file where you can find the object in question. The image in question is extremely interesting and must be artificial in nature according to UFO hunters and everyone else hoping to find traces of life on Mars. This view combines several frames taken by the Mast Camera (Mastcam) on NASA’s Mars rover Curiosity, looking into a valley to the west from the eastern side of a dune at the eastern end of the valley. The team operating Curiosity has chosen this valley as a likely route toward mid-term and long-term science destinations. The foreground dune, at a location called “Dingo Gap,” is about 3 feet (1 meter) high in the middle and tapered at south and north ends onto low scarps on either side of the gap. The component images were taken by Mastcam’s left-eye camera during early afternoon, local solar time, of the 528th Martian day, or sol, of Curiosity’s work on Mars (Jan. 30, 2014). The center of the view is about 10 degrees south of straight west. The left edge is about 20 degrees west of straight south. The right edge is northwest. The largest of the dark rocks on the sand in the right half of the scene are about 2 feet (about 60 centimeters) across. The image has been white-balanced to show what the rocks would look like if they were on Earth. A version with two 2-meter (79-inch) scale bars at distances of about 36 feet (11 meters) and 131 feet (40 meters) away from the rover is available as Figure 1. A version with raw color, as recorded by the camera under Martian lighting conditions, is available as Figure 2. We are referring to panorama image PIA 17931 which was released on January 30, 2014 by NASA’s team in charge of the Curiosity Rover as it gazed upon a sand dune called “Dingo Gap” here our very own Alien robot might have found evidence of the existence of ancient civilization on the red planet. Or at least that is how ufologists and ufo enthusiasts are looking at this image. In the panoramic view that image PIA 17931 offers, we should be able to see, in the lower right corner an artifact that eerily resembles a statue. According to UFO enthusiasts, this “statue” even has eyes, a nose and mouth, and it is impossible to be the result of mother nature on Mars. Is it possible that deep underneath the Martian soil, are the remains of buildings and other structures left behind by the ancient inhabitants of Mars? This is a question no one can answer today, but perhaps, in the near future, researchers will find/or not, evidence of life on the red planet. Who knows what secrets the red planet hides. If you look directly across from the elegid face artifact in the high resolution image you can see what looks like a pipe coming from the rock! !